The City of Exeter was situated on high ground, that could be easily defended, and overlooking the lowest fording place at which the Exe could be crossed. It was therefore natural, that the opposite bank of the crossing would develop into a settlement, as the city grew and trade routes expanded. This settlement, which became St Thomas, sits on a floodplain, created by a meandering River Exe. It is bounded on the north east by the river, and on the west, by the rising ground of Redhills and Dunsford. Routes used by the Dumnonii for trade, including an expanding tin market, between their settlement on the plateau of Exeter and other settlements to the south and west, radiated from the tidal crossing. Cowick Street direction to the west, and up Dunsford Hill, was probably an ancient route, that was later straightened by the Romans. Alphington Road, skirting the marsh land of what is now Marsh Barton, traversed a natural causeway, before climbing towards Dawlish and Torbay. And Okehampton Street shoots off to circle the north of Dartmoor, with an early branch towards Crediton, along the Exwick Road. And these branching routes radiate, like three spokes, with Cowick Lane and Buddle Lane, a partial tyre, joining the spokes. It is thought that the name Cowick may derive from the Saxon 'Coic', meaning, converging routes, or is it the much simpler, cow-farm. Early in the 5th Century the Romans left the City. It wasn't for another 200 years before Saxon settlers gradually moved in to St Thomas to farm the rich alluvial land and run sheep across the tidal marsh to the south east. After the Norman Conquest, William I made Baldwin of Brionne, Sheriff of Devon and Lord of 159 manors of Devon including Cowick. Around about 1100, Baldwin's son, who had inherited his father's lands, gave Cowick, and Exwick, to the Abbey of Bec, which was close to his French ancestral home. The Baldwins also owned property in London, which is now known as Tooting Bec. The Abbey of Bec set up a daughter-priory at Cowick Barton. This was happening all over the place, and was a neat way for the Normans to impose their customs, and Normanise the locals, without having to use an army. The monks of Cowick Barton built guest-rooms, a bakery, and a great barn to store the produce. They even produced their own, home grown, Saint Walter, forgotten for the last 700 years. The St Mary de Marisco Priory, was also opened in 1142, as a cell of Plympton. 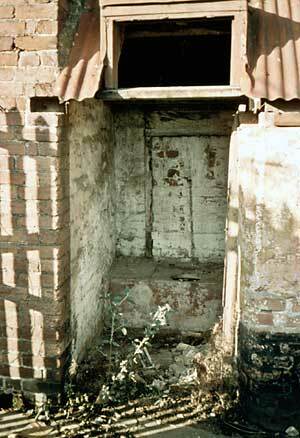 It was situated at Marsh Green Road North, and is now buried under an industrial unit. The chapel of the fledgling St Thomas, which was dedicated to St Thomas a Becket, was situated at the end of the the new stone bridge, that was completed in 1240 by Walter and Nicholas Gervase. In 1250, the chapel was made a church, creating the parish of St Thomas. The new bridge enabled the small settlement of St Thomas to expand, providing a way to the many water mills of Exe Island and Shilhay, as well as the City. Woollen cloth from country weavers would be taken through Cowick and across the bridge to the fulling mills (see Woollen Industry of Exeter) of Exe Island, to be returned across the bridge for dying and drying in the rack fields of St Thomas. All the flat and open ground, on each side of the river was covered with rows of newly dyed cloth. The settlement of St Thomas was very small, and confined to the area around the bridge. Further out were Hayes Barton, a manor house that was built in the area of Flowerpot Fields, and another manor house at Southbrook, in an area off Haven Road, that confusingly was also known as Floyerhayes, the linguistic root for Flowerpot Fields. 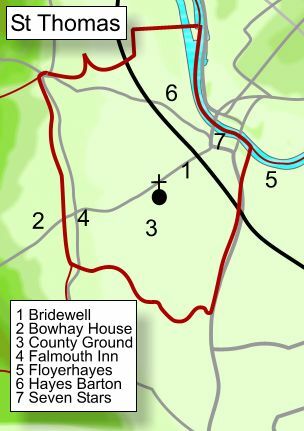 A fabric roll of 1324 lists a quarry at Barley, from where stone was carried on truckermucks and carts from the quarry, down Dunsford Hill, along Cowick Street and over the bridge, for Bishop Bronescombe's great 13th Century building development that would become Exeter Cathedral. The Courtenay's had come to England with Eleanor of Aquitaine, when she married Henry II in 1152. They married into the Redvers family, who would sporn the Bullers, and the Brionne family, giving the Courtenay's influence and above all, land - most of the Exe valley actually, including St Thomas, boxing Exeter in, and controlling the developing city's trade. Isabel de Fortibus, a member of the family and the Countess of Devon, built the famous Countess Wear to drive her mills. She left a 30ft gap in the centre, supposedly to allow navigation to the Port of Exeter. On her death in 1293, she was succeeded by a cousin, Hugh de Courtenay, and it was he who antagonised Exeter's Chamber by blocking Countess Wear completely, to force shipping to use his Port of Topsham. Both he and his father, also Hugh, were buried at Cowick Barton Priory. The younger became the first Earl of Devon, in 1335. Being on a floodplain, St Thomas has always been at danger from flood - in 1384 a torrent swept down the Exe, removed part of the stone bridge and St Thomas' Church. In 1412 a replacement church was consecrated, on land away from the river in Cowick Street. Soon after, in 1429, Bowhay House was built. As already stated, St Thomas was an important route into Exeter from the west and as such, was a natural place for the rebellious to approach the City. Perkins Warbeck marched through St Thomas in 1497 in his attempt to claim the throne from Henry VII. After breaking down the Eastgate and being driven out of the High Street, by who else, but the Courtenay's, he next entered Exeter, a prisoner of the King. The 1549 Prayer Book Rebellion saw a large body of Cornishmen, occupy St Thomas, and Exeter was held under siege, from a mob who mourned the loss of the Latin service and abhorred the introduction of the English prayer book. Robert Welshe, the 'Popish' vicar of St Thomas was a supporter of the rebellion, and was executed after the rebellion was put down. The site of Pizza Hut and its carpark, was once part of the Floyerhayes estate. It was occupied in 1520 by the Birdall family, who ran a foundry casting cauldrons and other items. By 1560 they were casting church bells - and it was here, that in 1616 they cast new, tunable bells for the Cathedral. One still hangs, amongst its younger upstarts, in the South Tower. 4th bell by 'Birdall', weighs 8cwt. 3qr. 10lb, tuned to C.
Inscribed "Anno Domini 1616 I B"
The Courtenay's had much of their Devon estate confiscated, after Henry Courtenay was executed, for treason on 9th January 1539 against Henry VIII. Lord John Russell was rewarded with some of the Courtenay lands, including St Thomas. By 1640, Lord Russell, the 4th Earl of Bedford, divested his interests west of the Exe to William Gould to fund a Fen drainage scheme in East Anglia. Gould, along with his brother Henry owned Cowick, Floyerhayes and Hayes Barton. In 1739, a certain James Buller married a Gould and thus St Thomas came under the patronage of yet another influential family, the Bullers, (see General Buller) a name remembered in several old inn names, a road and a hall, in St Thomas alone. Exeter came out for Parliament when the Civil War broke out in 1642. Soon, the city was surrounded by troops loyal to the King, and held under siege. The Royalists fortified buildings in Cowick Street, including the church, the gaol or Bridewell built in 1637, the West Indies Inn and Hayes Barton. On 31st July 1643, 1100 defending Roundheads poured through the West Gate, crossed the bridge and attacked the Royalist stronghold at Hayes Barton. The old, by now Tudor, mansion was burnt down and the Royalists driven back to the high ground in the west. Excavations in 1986 found many lead musket balls and a cannon ball around the site of the house. It was a small victory for the defenders, for in September 1643, the city surrendered to the Royalists commanded by Sir John Berkeley and Prince Maurice. The tide of the war turned again and in 1645, Parliamentary forces were approaching Exeter. Many houses along Cowick Street, Okehampton Street and Alphington Street were demolished to give the defenders a clearer field of fire. In January 1646, General Fairfax encircled Exeter, with Alphington as his army's head quarters. Barley House was also garrisoned, because of its good view across St Thomas to the city. On the 30th January, St Thomas Church was burnt down by the Royalists, collapsing the tower, to prevent its use by Fairfax. Hunkses Fort, thought to be the Bridewell, held out against Parliament until the surrender of Exeter at Poltimore House on the 13th April 1646. After the Civil War, much rebuilding took place in Cowick Street. It was these buildings that were demolished in the late 1950s and early 1960s for Gateway's St Thomas Centre and a road widening scheme. The church was rebuilt in 1656-7, on the same site in Cowick Street. In 1769, Exeter Turnpike Trust authorised a new Exe Bridge to be built - work started but it was destroyed by flood before it was complete. A start was made on a second new bridge which was completed, along with New Bridge Street, in 1787. "...the meanders of the haven, with its pleasant and often crowded banks; the shifting scenery of vessels passing up; and down; and the church and parish of St. Thomas, are truly picturesque; beyond these the finely cultivated country, interspersed with villages, farms, &c. between the city and the brown heights of Haldon..."
However, in the nineteenth century, St Thomas was losing its rural character. The Exeter Canal was extended in 1827, by James Green, to Turf and the canal basin opened in 1830, encouraging the development of Haven Banks. The Exeter Gasworks were built in 1836 and Willey's opened a new foundry in Water Lane later in the century. The railway came through St Thomas in 1846, after the third of a mile long viaduct was completed by Samudas and Clegg. 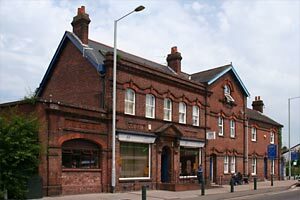 St Thomas Station is a rather impressive building, because it was the headquarters of the South Devon Railway. Brunel advised the directors of the railway to adopt the atmospheric system of propulsion - however problems with the seal on the pipe meant its abandonment, in September 1848, after a years operation. The last thatched house in Exeter and St Thomas, that was in Church Lane, disappeared in April 1882 as the streets on each side of Cowick Street were developed to house a growing number of railway and foundry workers. "Oh yes, they used to turn round there - we used to watch a man who would take it (the pickup) down with the pole and move it to the back of the tram and put it up again. They were terribly noisy"
To allow a flat crossing of the Exe for the new trams, the 1787 bridge was replaced with a new, single span, cast iron bridge designed by Sir John Wolfe Barry, the designer of Tower Bridge. St Thomas started its own fire brigade from July 1889 and opened a fire station in Cowick Street in 1898. However, it closed within two years, after St Thomas was incorporated into Exeter. The land of the County Ground off Cowick Street was first used in 1841 for wrestling matches, and became the home of the Exeter Chiefs and Falcons. The St Thomas Pleasure Ground was opened in 1891 to improve the health of the local population. In 1899, the parish was incorporated into the City of Exeter, at a time when improving housing for the poor was becoming more prominent - an early fruit of the new administration was the first council housing in Exeter at Isca Road. More council housing was built in Buddle Lane in the 1920s and further housing after the war in Redhills. The County Ground was taken over by the military, mostly for army transport, and the American forces preparing for D-Day also used the space for stores and transport. Tin Lane, by the County Ground was a favourite place for US troops to 'romance' with the local girls. At that time black American troops were not allowed to mix with whites, so they were confined to the St Thomas side of the river, living in tents in the County Ground. Military Police were placed on Exe Bridge to prevent them crossing, and thus keep them out of dances at the Civic Centre and other venues in the City. The year 1960 was momentous for St Thomas, when it was flooded twice leading to the building of the twin bridge system and flood channels to prevent another damaging flood event. Many buildings were also demolished along the Alphington Road and Cowick Street on the river side of the railway. 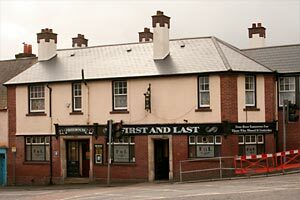 The seed merchant and millers, French's owned the block of buildings between the railway viaduct and Buller Road, and from the rope walk to Cowick Street, including the Turk's Head and Moreton Arms. Here they ran an animal feed mill and seed store; the site also contained Barton Motors and the Exeter Munitions Company, in Buller Road, which started up for the war effort and continued after hostilities ceased making large valves for the gas industry. The whole block was demolished in 1970 for the St Thomas Shopping Centre, developed by Gateway. In the mid 1980s, Sainsbury's developed a new store and the Riverside Leisure Centre opposite the Exe Bridges on land once used for casting church bells - it didn't last as long as the bells, for within 15 years, Sainsbury's had relocated to Alphington Cross to be replaced by Boots, Next and Pizza Hut! St Thomas is still changing, with old redundant buildings making way for new developments. The County Ground is succumbing to the bulldozer, to make way for housing, just another change in the long history of St Thomas. Map of St Thomas showing the modern political boundary. • During the 1832 cholera epidemic, there were 274 cases and only 38 deaths - far fewer deaths, as a percentage of cases, than in Exeter itself. • The Welcome Inn on the canal, was supplied with free gas when the gasworks opened. It is still lit with gas. • The population of St Thomas in 2001 was 6,246. • The population in 1850 was 4,301. • In 1688, William of Orange approached Exeter by riding through St Thomas. 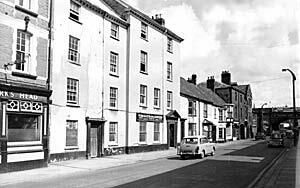 • Exeter's first theatre space was the Seven Stars Inn. • In 1901 a census showed that 3,722 people crossed the bridge between 6 and 10am. Between 7 and 11Pm 5,610 crossed the bridge. • There is a memorial in the churchyard to the Northumbrian lifeboat heroine, Grace Darling. • John Reynolds, grandfather of Joshua Reynolds was made Anglican vicar of St Thomas in 1662. • In January 1855, a joint of meat was roasted on the frozen Exe at the back of the Seven Stars. • The Quaker, George Fox, preached secretly at the Seven Stars in 1657. • A barrel of beer from the Royal Oak was swept 7 miles out to sea after the 1960's floods. It was picked up by HMS Highburton. 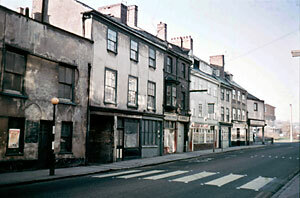 • Some of the 1,300 French and American prisoners ordered to Exeter were incarcerated in St Thomas Bridewell in 1770. The rest went to Alphington. Cowick Street showing the old Fire Station. The northern side of Cowick Street is now the St Thomas Shopping Centre. The Turks Head is on the left, and the Moreton Arms is the small building opposite the street lamp. Photo courtesy Murray French. Street name meanings Beaufort Road - named after the 14th Century Beaufort House, built by the Duke of Exeter, John Holland. The house became the Bridewell in 1637. Buddle Lane - possibly named after the Budgell family. It also may also derive from the Saxon bothl for house. Buller Road - named after the Buller family. Cowick Street - probably derives from coic, for converging roads. Dunsford Road - leads to Dunn's Ford on the River Teign. Gervase Avenue - takes its name from Nicholas and Walter Gervase who built the first Exe Bridge. Tin Lane - may allude to the tin fence by the side of the County Ground, or it may be much older and relate to the tin trade. Haven Road - named after the haven used by shipping. An 1835 map shows it named Painters Row. Pinces Road - is derived from Robert Pince, the great grandson of nurseryman William Lucombe. The area was a former nursery. Shooting Marsh Stile - the area once afforded good shooting.